Road Safety Week Aotearoa begins tomorrow and runs through until 14 May. While road safety should be a priority year-round for all road users, it’s important that awareness of the issue is raised in our often car-centric city. We spoke with George Weeks, formerly of Transport for London and now part of Auckland Council’s City Centre Design Team, about his thoughts on road safety in London and here in Auckland. Do you consider London a safe city for pedestrians, cyclists and drivers? London has made good progress over the past decade, but there is still a lot of work to do. Transport for London (TfL)’s most recent road safety statistics show considerable drops in accident numbers in 2015 (the most recent data available) compared to the 2005-09 average. Cycling safety has improved markedly; 33 cyclists died in London in 1989; the Killed or Seriously Injured (KSI) rate per journey has since dropped by over 80 percent while the number of daily cycling trips has more than tripled since 2000. Pedestrian KSIs have also dropped but remain too high. This was brought home to me in devastating fashion earlier this year when a friend of mine, Dr Jasjot Singhata, was fatally hit by a car in Dulwich. 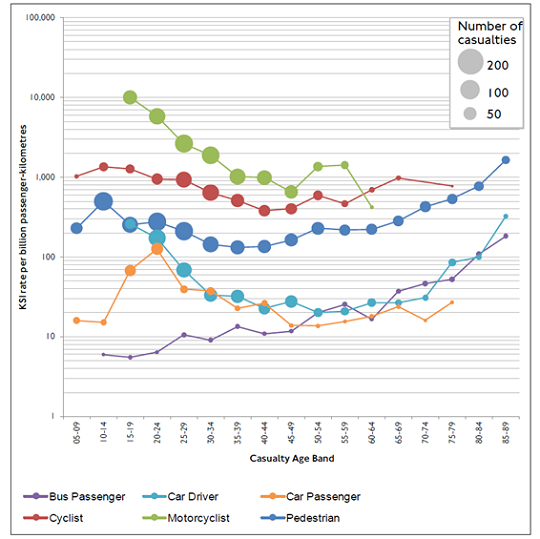 TfL collects these road safety statistics and uses them to inform policy. An example is the mode-and-age KSI chart shown below. I cycle most days in Auckland and the standard of driving is pretty similar to back home, though there are significantly fewer buses to contend with here. 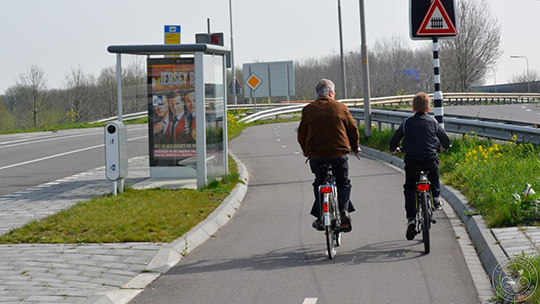 Major road junctions in both cities can be difficult on a bicycle because there is not the uniformity of provision (cycling infrastructure is suitable for all potential users) that characterises cycling in the Netherlands. The walking experience in Auckland can be very pleasant; this is a much more attractive city than many people seem to appreciate. Again, the difficulties can occur at major intersections and barriers such as the Central Motorway Junction. 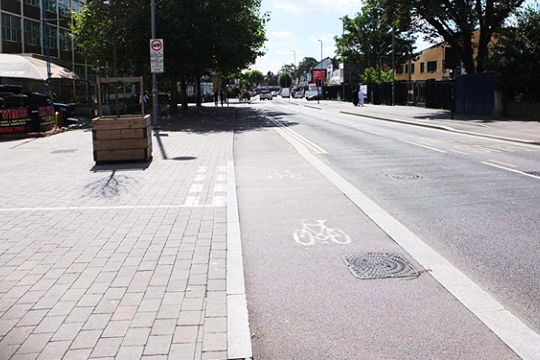 ‘Uniformity of provision’ is a design philosophy that means cycling infrastructure is suitable for all potential users, whether they are young or old, fast or slow, experienced or inexperienced (Source: Cycling Embassy of Great Britain). What road safety initiatives have been successfully used in London? Many road safety initiatives have taken place – too many to list here. TfL, as the single integrated transport authority for London, is able to do a good job of basing its road safety initiatives on evidence and there is a good repository of resources here. One particularly interesting example is that of cycle safety at roadworks. The traditional approach was to use a “Cyclists Dismount” warning sign. This is no longer acceptable. 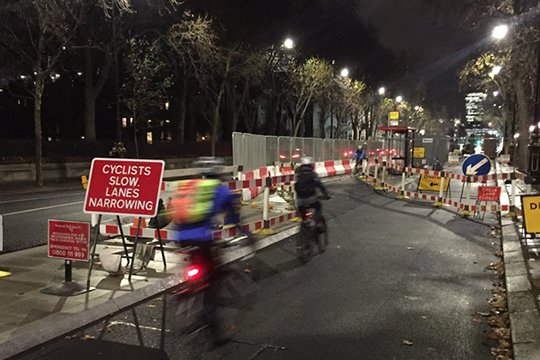 Proper cycling diversions are increasingly used, particularly on Cycle Superhighways. Rather than being forced to dismount at roadworks in London, cyclists are now told to slow down (Source: @citycyclists). The theme of this year’s Road Safety week is ‘speed’ – do you think the design of Auckland’s roads encourages speeding? In many cases yes, though this does vary. The Dominion Road Flyover, which I use every morning, appears to have been transplanted from a rural motorway into inner-city Auckland and is a very fast stretch of road. 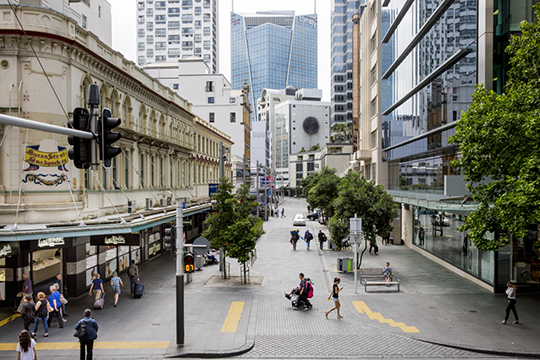 Other streets such as the laneways and shared spaces in Auckland city centre are pretty good at using horizontal deflection and surface treatments to create a low speed environment. Many of the suburban streets in the Isthmus are tree-lined, grassy and interspersed with parked cars, all of which reduce speeds. Just as in the UK, the problems tend to occur where people have used road design manuals in an attempt to create streets, with corresponding junction treatment and curve radii. There is a light at the end of the tunnel; AT’s forthcoming Transport Design Manual (which is itself based on the UK’s Manual for Streets) has the potential to address this issue. Fort Street uses horizontal deflection and surface treatments to create a low speed environment. Are there any lessons Auckland could learn from London to reduce speeds and improve road safety? London has a 2020 Road Safety Action Plan published in 2013. This approach set out specific targets and how to achieve them. There are further Road Safety Action Plans for walking and cycling. Borough-wide 20mph (30 km/h) zones have been delivered in about half of London’s boroughs; these are an important first step but do not address fundamentally high-speed highways designs. The most interesting lesson in this regard is the Mini-Holland programme, which has been delivered most successfully in the London Borough of Waltham Forest. This aims to ensure that active modes are accessible to anyone in the borough through streets that are attractive and accessible to walking and cycling. It uses a combination of protected cycleways on main roads and filtered permeability, (principally used to “filter out” car traffic while still letting pedestrians and those on bikes through), on residential streets to achieve this. Crucially, this not only reduces traffic speed, it substantially limits traffic volumes. Not only are the streets safer, they are also much more pleasant. This in turn relates to London’s Healthy Streets approach. To sum up, road safety is fundamentally about improving the quality of the human habitat. It requires a complementary set of interventions within a coordinated framework based on objective population-level statistics. A narrowed vehicle carriageway, protected cycle tracks and blended footway at the Grove Road/Hoe Street junction in LB Waltham Forest. The ADM Streets Hub features case studies on streets around the world and the measures that were taken in making them safer places for pedestrians, cyclists and cars. Auckland Transport are currently developing a street design manual which will be made available later this year.